Everything seems to be going right for Patrick Sandoval. 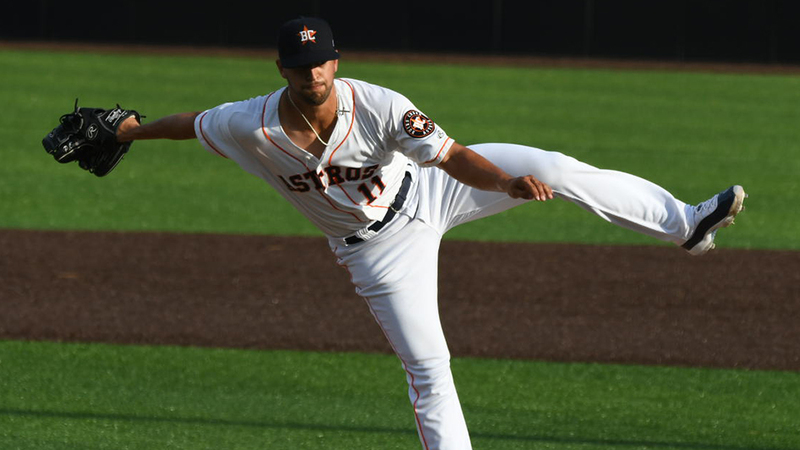 The Astros prospect tossed seven one-hit frames to extend his scoreless streak to 33 innings as Class A Advanced Buies Creek beat Down East, 3-1, on Wednesday at Jim Perry Stadium. "I don't think there's one thing I can pinpoint," Buies Creek pitching coach Drew French said. "I think it's having command of four pitches and being aggressive in the zone. He forces a lot of swings and there's a lot of weak contact. He really challenges hitters and I think he does that with all four pitches, which is a plus for a guy with his caliber of stuff." Sandoval (2-0) hasn't allowed a run since June 3, a stretch that includes all three starts for Buies Creek. Since he was promoted from Class A Quad Cities, he's yielded four hits while striking out 20 over 16 innings. On Wednesday, the left-hander used his off-speed pitches effectively. "Today, it was his changeup," French said. "He had 12 swings and misses on his changeup today and another six or seven on his slider. The curveball is a work-in-progress in terms of making it a putaway pitch, but he's able to throw it for strikes early in the count and do some things where he can get to his changeup and slider with two strikes." Last time out on Thursday, Sandoval gave up a lone single over five innings. He hasn't been charged with an earned run in eight starts since May 23, a span of 41 innings. Against the Wood Ducks, the southpaw retired the first nine batters before walking LeDarious Clark to lead off the fourth. After balking him to second and issuing another free pass to Alex Kowalczyk with two outs, the 21-year-old retired Charles Leblanc on a fly ball to left field. "I rarely have to sweat when he's out there. He's in complete control," French said. "From a maturity level, in his Draft year in 2016, the upward trend that he's on and he has his feet in the ground in pro ball, those things are very apparent. He tends to respond versus react." Josh Altmann doubled with two outs in the fifth, but Sandoval set down the final seven batters he faced. He exited after punching out Rangers No. 29 prospect Brendon Davis, having thrown 66 of 95 pitches for strikes. Over 74 innings across both levels, the California native has walked 11 batters, including three over his last 36 frames. "He has tremendous feel," French said. "I think it's kind of elementary to say, but he gets ahead in the count. He's always 0-1, or if it's 1-0 he's squaring it up 1-1 so he has the opportunity to get into a high leverage count for a pitcher, which is 1-2 or 2-2. It's not a surprise; I had him in the Midwest League last year towards the end, and he's got big league preparation and routine. It's not a surprise to me that he's prepared for every outing. It comes down to execution. He goes out there and executes the game plan, and he did that tonight." Colin McKee gave up an unearned run on two hits and a walk with two strikeouts over the final two innings for his second save. Osvaldo Duarte, Bryan De La Cruz, and Carlos Canelon each drove in a run for the Astros. Wood Ducks starter Walker Weickel did not figure in the decision after allowing four hits and a walk while fanning one over five scoreless frames.